Aquila Barn offers a luxury on-farm retreat at Table Cape on Tasmania’s North West Coast. Set high on the plateau fields where sea thermals dance, this award-winning accommodation is elegant and sophisticated. The Aquila Barn caters for two guests and is appointed with a queen-sized bed, hay-loft mezzanine and high vaulted ceilings. There is a fully-equipped gourmet kitchen and open-plan living where you can sink into a leather couch by the wood heater. Here, you’ll be captivated by the play of wind and light on the rolling fields to the river valley below through floor-to-ceiling double glazed windows. During the evening the luxurious bathroom with floor heating and deep bath awaits, overlooking the pleasant fern garden. Aquila Barn is an ideal base from which to explore Tasmania’s diverse North West Coast. Explore the Aboriginal stone fish traps on the foreshore or take a gentle river walk where platypus play and discover the quaint seaside towns of Boat Harbour and Stanley. You may also wish to discover the enchanted forests of the Tarkine and the mist enshrouded peaks of Cradle Mountain. 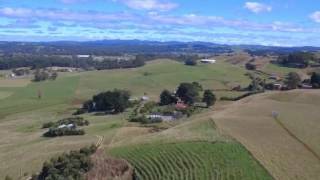 Aquila Barn is just minutes drive from the Burnie-Wynyard Airport where frequent flights connect Wynyard to mainland Australia and beyond. The tall, from the floor, double-glazed/tinted windows, allude to a spacious and welcoming interior. High vaulted ceilings, soft timber linings, Tasmanian myrtle bench tops and feature timbers, hat-loft mezzanine and medieval up-lighting enhancing the original character of this now elegant and extremely comfortable, fully self-contained, romantic retreat for two.